High windows reach the roofline, reflecting the surrounding greenery as they widen toward the sky. 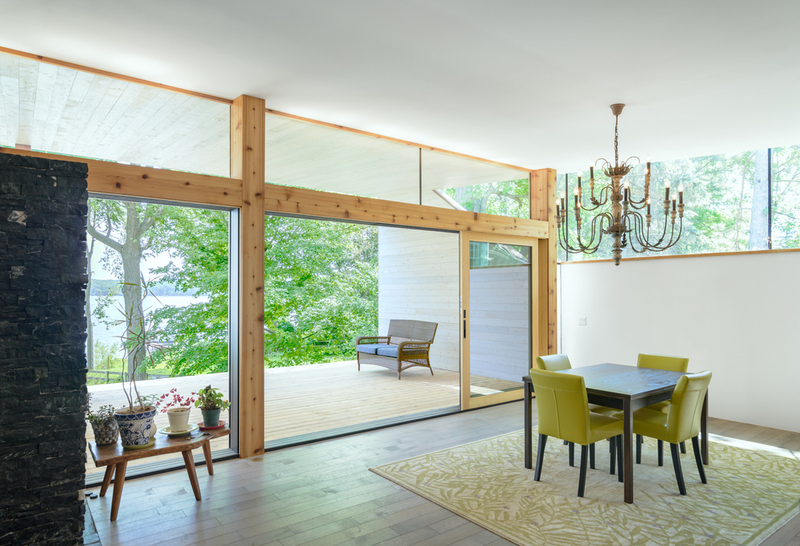 The logic of cutting into walls to reveal the tree canopy extends throughout the living spaces of the two-bedroom house while preserving privacy. Low birch walls meet the soapstone fireplace, forming a cozy lounge zone. Wood shutters can be opened to bring in air, expanding the rooms in spring and summer. A floating walkway leads to a recessed entry. It can be challenging enough to find the right frame for a painting. But what if you want to frame an ever-changing natural environment—and you also want to live inside the frame? The spaces of the Thumb House actively engage the surrounding landscape. 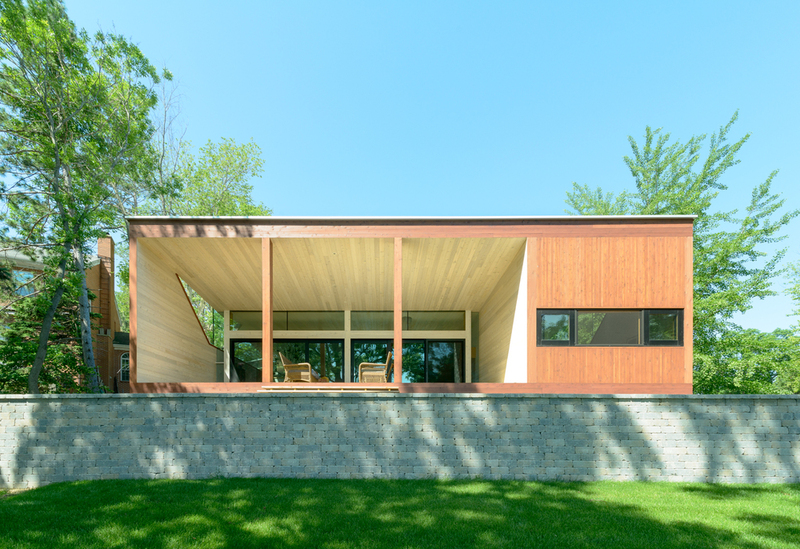 Where the warm wood façade of the house recedes within a zinc wrapper, a wide outdoor room opens toward the lake, framing a panoramic view of water and sky. White-stained wood lines the inside of the outdoor room, transitioning smoothly into the white interior of the house at a glass wall. 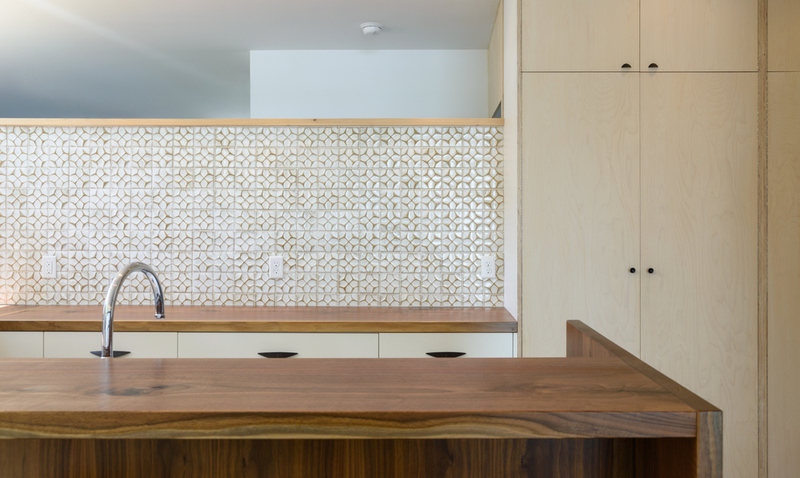 The logic of cutting into walls to reveal the tree canopy extends throughout the interior living spaces of the two-bedroom house while preserving privacy. Beneath high, continuous landscape windows, low walls define dining and lounge zones with a varied material palette—including tile, soapstone, birch, and walnut.A thumb-like extension disrupts the rectangular geometry of the house to form a secluded study, where a window dips down over the desk to present an intimate view through a field of tree trunks to the lake. Wood shutters can be opened to bring in air, expanding the rooms in spring and summer.